I’ve come up with 80 uses for paracord – but I need to get to 100. Check out this list and help me come up with the other 20 uses! Last week a friend of mine saw the paracord lanyard that I keep on my keychain and asked what it was for. I explained a little history of paracord and told him and many of the different ways that it could be used. I told him (jokingly) that there were over 100 different uses for paracord. He laughed at me and said that if I could list off 100 uses he would take me out to my favorite steak joint and buy me dinner. What he failed to say was that I couldn’t have help getting the list together. Paracord is even sturdier than rope, and is always a great piece of gear to have on-hand when you need to secure a tarp for your shelter. There are plenty of lanyard projects for paracord, owing to the great flexibility and versatility of the material. A paracord lanyard provides easy access to your essential items while on the go. This is an exciting project because you that you have an amazing multi-purpose tool, ready to be used anytime, anywhere you are. Truly a must-have for any prepper and survivalist. If you feel hungry out in the wilderness, paracord can be used to trap food. A snare may seem primitive but it has been proven effective. What’s even better is the fact that it can be used to trap human foes as well. You can also catch fish with your parachute cord. If you have a fishing hook and a rod, whether ready-made or improvised, you’re ready to get some food. This is another one of the many ways to bring along lots of paracord without anybody knowing, and boots can hold long stretches of cordage. Of course you don’t want to be barefoot after using some of it so you can try a new trick: double lacing. In survival scenarios, personal hygiene might be sacrificed for more important things, but who says you can’t keep your teeth? Just cut up the outer shell of the paracord and you can use the strands to remove the food and plaque between teeth. Preppers and survivalists who love dogs will definitely enjoy working on this project. I mean, who would expect to have yards and yards of paracord from a dog leash? SHTF can take place anywhere at anytime and that includes life and death situations. Add some paracord to your first aid kit because it might help in closing cuts or wounds. Sometimes knife handles break from hard use. Paracord can be used as a substitute. It makes the knife easier to hold. You can also make a loop at the end of the handle for an added handling option. Making fire with friction is primitive but effective. This is another one of the many survival uses for a paracord. Drying clothes may become difficult when you have bugged out. Set up a clothes line using paracord and you will have warm, fresh and dry clothes. You can also have a paracord clothes line at home if you like. We’ve been doing this for a long time with ropes. All you have to do is use paracord and you can rest after a long day of hunting and gathering. A torn sail at sea can spell disaster. Leave the cursing and blaming behind and mend that sail with paracord so that you can keep going. This is probably one of the most popular paracord projects. A belt is a great way to store and bring along a huge volume of cordage. Be prepared and look good doing it. Outdoor cooking is made easier with paracord. You can also build a campfire crane with the help of this super useful cordage. There are so many strong and tough threads inside a parachute cord. They can also be used to sew things together. And you thought fishing with paracord only meant using it as a line for your hook and rod? You can also fabricate a fishing net from the strands. These days a hammock is not only good for a cool nap. It can be used as a temporary dwelling when you bug out. A sling makes bundling and carrying cargo easier. A paracord sling adds another benefit which is having cordage available to you anytime you need it. A trip wire gives you a sense of security when you have camped out in a strange place. You can rest easy knowing that you will get a warning if there is an intruder. I believe that a paracord watch strap should be on every prepper’s wrist. You can make one or buy one, and you will not regret it. It is dangerous to string your bow without any stringer. If you have been into archery for some time, you know exactly what I mean. It’s always a good idea to have some paracord with you, like when you forget to bring your stringer. It is essential to know how to improvise gear. Depending on expensive or high tech equipment will not save you all the time. Hoses collect dirt as time goes by, not only on the outside but also inside. That mud, grease or dirt will clog up the hose in addition to making it look disgusting. Get your paracord, tie granny knots in it and pull it through that dirty hose. With all the distractions kids are dealing with, they often tend to forget the more important things. Make a keyholder from paracord and tie it to your child’s wrist or favorite bag and you can be sure they’ll be safe indoors when you’re not around. It’s a fact of life that things break down sooner or later, and that includes your vehicle. If you don’t have a tow rope when your car is not working, your bundle of 550 cord will come in handy. It doesn’t take a genius to figure out that moving large chunks of wood demands lots of physical exertion. Factor in a hill and the problem only gets worse. A pulley line will make the work much lighter. Stropping is a quick and easy way to keep the edges of your razors or blades sharp. You are maintaining as well as extending the life of your tools. Give the children a fun activity. Skipping rope is a great way to exercise and maybe divert their attention from the aftermath of a disaster. You can even join in if you like! 33: Hang mesh frames for propagating plants in greenhouse. Be creative with your homesteading garden. With a mesh made from paracord, you don’t need to buy a wire trellis anymore. Keep bears away from your food. Hang your food supplies on a tree branch up high and keep those grizzlies at bay. 35: Rudimentary swing for the kids if and when they become bored. The children will get bored when you have camped out for some time. Parachute cord is strong enough to make a swing with. This way you’ll keep the kids happy. When you don’t have a rope with you, paracord can take its place. Just make sure you have enough and you know the proper way of rappeling. This paracord hack will keep the ladies looking nice and neat. 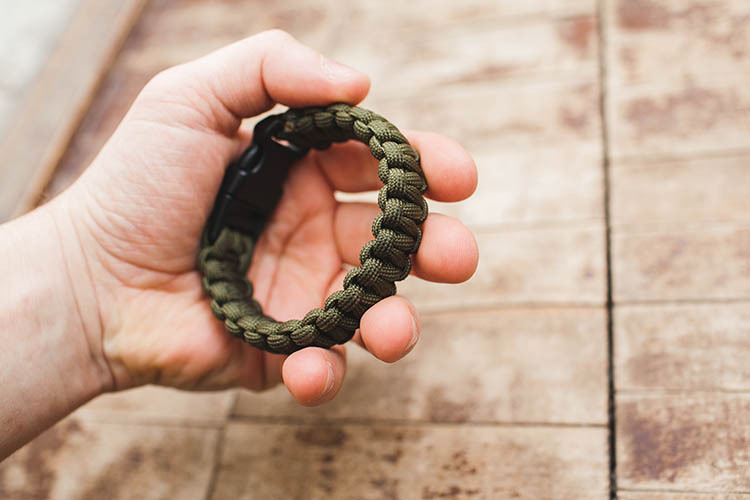 Of course the guys with long hair will also benefit from paracord hair tie. Carrying firewood back to camp can be a daunting task. Bundle them together with your 550 cord and it becomes a piece of cake. Walking with heavy load can make movement impossible. Your feet will only sink deeper with every step. It is better to put your cargo on a sled and drag it along with paracord than carrying all that weight on your back. Finding the toilet in the dark is a difficult, if not disastrous, proposition. You would rather have the light on so you can find your way to relief. And that paracord is really helpful in setting up that light. It’s so frustrating when a light is difficult to turn on because the pull string is missing. Paracord make a great replacement. When bugging out, you might need to improvise a little when it comes to home decor. Paracord is strong enough that it will keep mirrors and other large, heavy objects suspended. Use paracord to make a rudimentary pulley system for moving heavy weights. If you’re in need of horse tackle, don’t fret. Paracord can be used to make a makeshift knotted halter. Cleaning your weapons can be tricky without the proper equipment. Once again, it’s paracord to the rescue. As previously mentioned, it’s easy for kids to get bored in a bug out situation. Have them help you make a tire swing out of paracord. The project itself and the hours of entertainment provided by the swing will keep them occupied. I mentioned earlier that a hammock can be made of paracord. But even if you already have a hammock of your own, paracord can still come in handy when it’s time to hang it. An emergency whistle is important to have in a disaster situation or when bugging out with a group. Make sure you have a whistle on you at all times with this paracord hack. This is just another way paracord can help you in your woodworking projects or when building a shelter. It can be nervewracking when you’re out on the water and need to repair your boat. Sailers and boaters should always have a spool of paracord handy. Without a pull cord, that lawnmower is just a very large, expensive paperweight. Use paracord and save money on costly repairs. If you’re injured or are suffering from heavy bleeding, and you can’t get to a hospital immediately, a tourniquet can be used as a last resort. When traveling with a lot of gear, it can be easy to drop or lose track of what you’re carrying. Tying it all down with paracord can keep your cargo in place and accounted for. Keep the items in your rucksack secure with this quick and easy paracord fix. Tie paracord between two trees to construct a tube tent. A monkey fist can be an effective self defense tool when you don’t have other weapons on hand. They are pretty awesome. Need to make your rucksack more secure? Tie down the lid with paracord and keep your items in place. In an emergency medical situation, this project could literally be a lifesaver. Make sure your shelter can withstand the elements by securing it with strong 550 cord. Improvised weapons are great for hunting in the wild when you don’t have traditional weapons on-hand. Paracord is perfect when constructing a spear. No need to worry about your flashlight slipping out of your hands when you’ve got a paracord grip. Lowering cargo down a cliff can be a precarious situation, but your trusty paracord will help you get the job done. When tied correctly, you can be sure that these makeshift handcuffs will keep your captive from escaping or turning back on you. In a survival situation, it’s important to take some time to relax and let your mind wander. Tying and untying paracord knots is a great way to unwind (no pun intended)… plus, you get to practice tying knots, so you know exactly what to do when you actually need them. A broken zipper is one inconvenience you don’t want to deal with in a survival situation. Use paracord to fix a broken zipper pull. A ladder isn’t exactly practical to carry with you in your bug out bag, but some paracord and some found sticks or boards make a perfect makeshift one. There’s nothing more frustrating as a hunter than having your kill stolen overnight by varmints. Paracord can help you hang it out of their reach. Keep your boat safe and secure by using paracord to dock it. Sure, this might not be a “survival” necessity… but on your next trip to the lake, you won’t have to worry about broken ski ropes if you’ve got paracord handy. Paracord is easy to manipulate, so it’s great to learn to tie basic and more advanced knots. Once you learn the basics of tying the knots, you can start working with thicker, heavier rope. Tie a knot and place inside a plastic bottle, hang from a rock or damp surface and the water will collect on the cord and drip into the bottle. Wrap paracord around a tree to use as a grip and make it easier to climb. Keep your feet warm and dry with these improvised paracord snow shoes. 76: Make a sling for killing small animals. Hunting and trapping is made much easier when you’ve got plenty of paracord on-hand. A paracord bullwhip like the one pictured above can be fun to play around with, and can also be used for self defense when needed. When you’re bugging out and hungry, you’ll be glad you brought some paracord along to help you catch your next meal. If you didn’t pack a fishing net, don’t worry — as long as you brought some paracord along, you can construct your own. The great thing about paracord is that it’s so versatile. If one strand isn’t strong enough for your needs, weave multiple strands together to make a sturdy rope. That’s all I can come up with, so far… Can you help me enjoy a steak dinner? Leave your suggestions in the comments below!